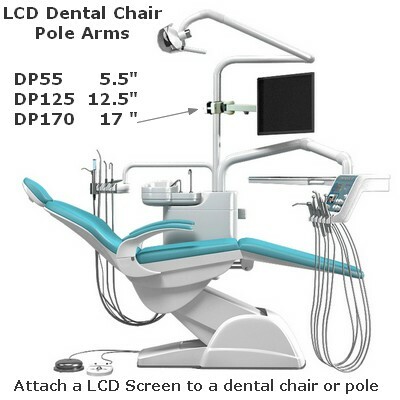 Attach a LCD monitor to a dental chair or a pole in minutes. 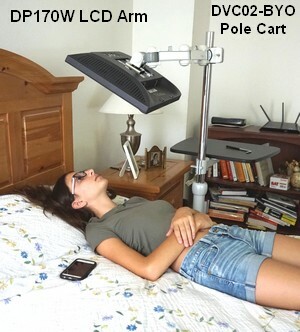 This LCD bracket's unique articulation will allow you to point the monitor everywhere: to the front, 90 degrees to each side, 90 degrees down to the floor (for bed, dental chairs, etc....) or up to the ceiling (e.g. for touchscreeens). The LCD bracket also rotates 360 degrees, for landscape or portrait viewing. 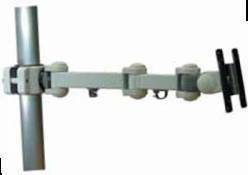 100% steel-made, this articulated LCD pole arm has an "elbow" joint in the middle and an articulation at the clamp, allowing the screen to be extended 17.5" or pushed back close to the pole. The arm also swivels 90 degrees to each side. This is our most popular LCD / TV mount for Dentists, and is also very popular in trade-show exhibits, restaurants and many industries. - D200100 VESA Backet adapter: extends the applicable mounting holes pattern to 200 x 100, for larger TVs.